I’ve already written that Doctor Doom is my all-time favorite Marvel villain, but Magneto is easily in the top five. Few Marvel villains have featured the nobility and malleability of Magneto, as he has progressed from irredeemable supervillain to misunderstood empathetic hero and back again. I may be overlooking something, but Chris Claremont’s Uncanny X-Men #200, “The Trial of Magneto,” is the first time in Marvel history when a villain “broke good” for a sustained number of years. Magneto’s a trailblazer in that regard, and although it was only a matter of time before Eric entered the 90’s and succumbed to Jim Lee’s awesome evil art, Magneto’s complexity has remained essential. Below you’ll find a complete chronology for Magneto comic books throughout Marvel history, including alternate realities where he played an essential role like Age of Apocalypse and House of M .
Greg Pak and Carmine Di Giandomenico bring Magneto’s tragic childhood to life, showing his Jewish family’s suffering in Nazi Germany. The Jack Kirby and Stan Lee Uncanny X-Men kick off with a bang, and Magneto as the X-Men’s archnemesis right out of the gate! Avengers #47 to #49 features a showdown between Magneto and the Avengers. Uncanny X-Men #63, “The Triumph of Magneto,” with excellent Neal Adams art! Some of the first issues after Jack Kirby left Fantastic Four feature Magneto attacking New York City, and proving his bonafides as a Marvel Universe villain. Surprisingly important developments in the relationship between Professor X and Magneto that will come up during the Claremont run on Uncanny X-Men. Len Wein, Chris Claremont, Dave Cockrum, and John Byrne ressurect the X-Men, as well as Magneto, elevating Marvel’s merry mutants to the most popular comic in the universe. For the full X-Men experience during this time, I recommend Comic Book Herald’s complete Claremont X-Men reading order. Magneto battles Doctor Doom, who would otherwise take over the world. Uncanny Men #148 to #150 are the essential Magneto focused comics from this period of time, with #150 marking both a true turning point and one of the more frequently referenced moments in Magneto’s history. Includes, X-Men: God Loves, Man Kills , my favorite X-Men graphic novel includes some of Claremont’s best characterized Magneto, as he finds common ground with the X-Men for a time. If you want to see Magneto yell at a Bovine midwife (and who doesn’t), boy is this the comic for you. 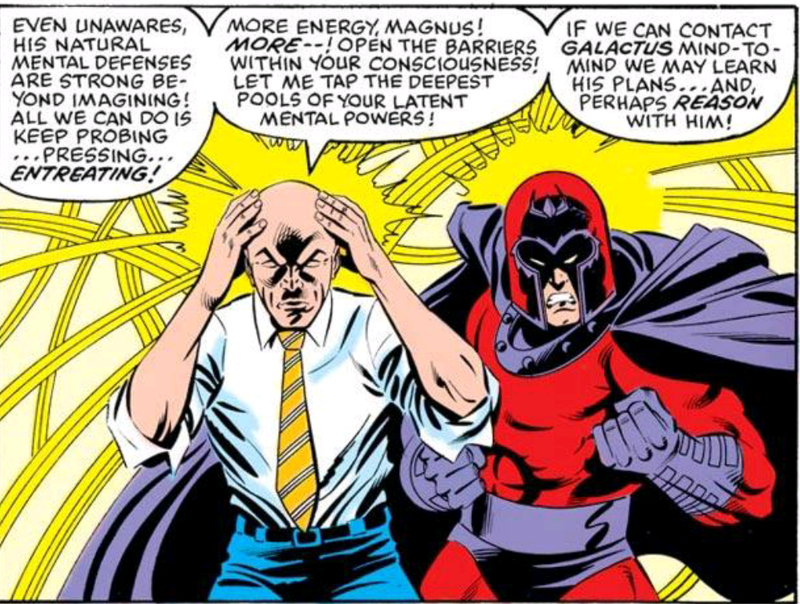 The original 1985 Secret Wars are particularly telling for Magneto, as Marvel writer and editor-in-chief Jim Shooter draws on Magneto’s inherent nobility and aligns him with the heroes. Plus, if you’ve ever wanted to see Magneto lay some serious game on the Wasp, this is your comic. It’s around this time in Uncanny X-Men history that Magneto’s timeline becomes intertwined with Claremont’s concurrent ongoing run on New Mutants. I’d recommend at this stage that you view the Claremont X-Men reading order for the absolutely complete guide to all the comics from this time period. For Magneto, you essentially want to keep tabs on Uncanny X-Men #188, New Mutants #24, New Mutants #29, and Uncanny X-Men #196, and #200 to #202. Magneto, headmaster of the New Mutants! These issues overlap with Secret Wars II, and while I wouldn’t wish reading the entire slog on my worst enemy, there are some important New Mutants tie-ins that will make Magneto’s turn as hero-mentor all the more difficult. Not to be confused with the 2012 Marvel event, Avengers vs. X-Men. Fall of the Mutants hits Magneto particularly hard, as the culmination of his somewhat atrocious leadership of the New Mutants really takes a dark turn. The New Mutants discover Magneto’s relationship with the Hellfire Club. I’d recommend reading the New Mutants tie-ins as part of the Inferno reading order within the Claremont guide! New Mutants, and Illyana in particular, play a crucial role to Inferno. Magneto vs. the Red Skull! Perhaps the most violent battle between the X-Men and Magneto. The ramifications of this showdown are felt through the 1990’s. Collects: The complete Age of Apocalypse saga. 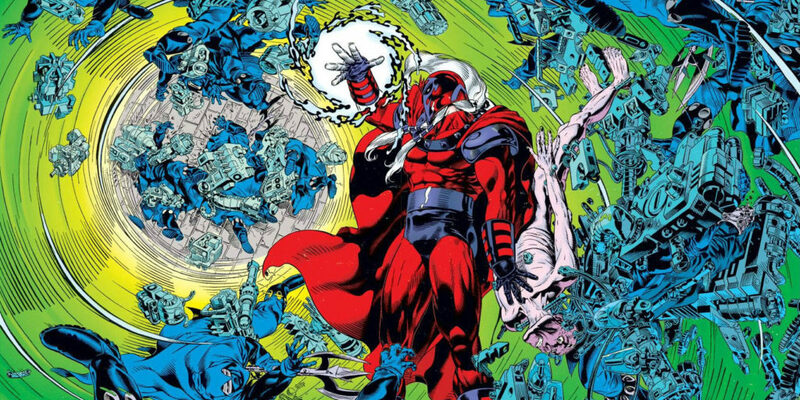 The Age of Apocalypse epic is likely my favorite Marvel alternate reality, and my favorite Magneto comic of the 90’s. For the full experience of Magneto in the AoA, try Comic Book Herald’s complete Age of Apocalypse reading order. Collects: The complete Onslaught saga. Coming back out of the Age of Apocalypse and into Earth-616 proper, the ramifications of Fatal Attractions are felt in a brand new X-Villain, Onslaught! The most powerful Marvel big bad of them all can be found in Comic Book Herald’s complete Onslaught reading order. Magneto War undoes the Joseph years of the 90’s and restores Magneto. Wolverine gets revenge on Magneto. Grant Morrison and Frank Quitely’s run on X-Men from 2001 to 2004 will make more sense taken as a whole, but these are the primary Magneto issues. Claremont returns to Excalibur for a new series featuring Professor X and Magneto. 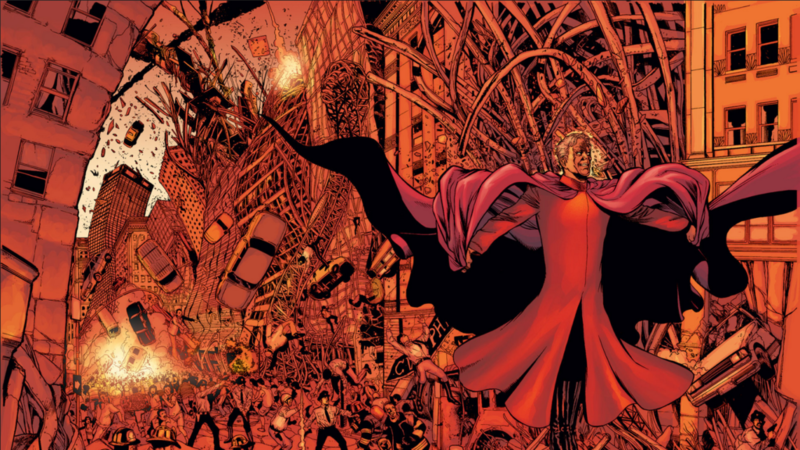 Magneto’s relationship with Scarlet Witch takes center stage, as Marvel sets up the House of M.
Magneto rules the world! What could go wrong? Read through the entire event in Comic Book Herald’s House of M reading order. Good House of M tie-in that really dives into Magento’s role as leader of the House of M universe. Quicksilver and Magneto throw down. More of a Quicksilver (and even Inhumans) comic certainly, but the titular M is involved. Fallout from the House of M. Part of the Brian Michael Bendis run on New Avengers. Magneto, hero of the Marvel Zombie-verse! Magneto seeks to aid Professor X in the wake of Messiah CompleX . Magneto returns to a familiar role as mega villain of the X-Men. Magneto surprises the X-Men with a new kind of proposition. Magneto’s role is largely tied to his place as the father of the Scarlet Witch. You can see any and all context in Comic Book Herald’s Fear Itself reading order. Uncanny X-Force #9 is a great one-off Wolverine and Magneto story. 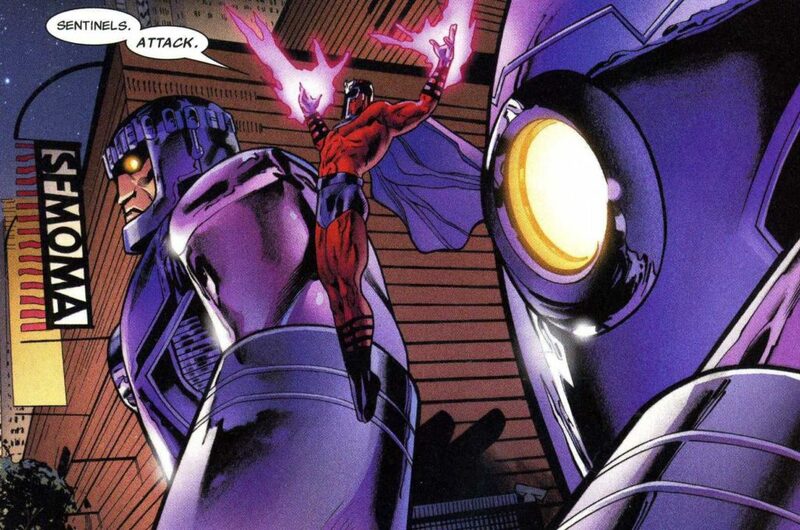 Avengers vs. X-Men has major ramifications for Magneto, both for his place with the X-Men and his abilities. 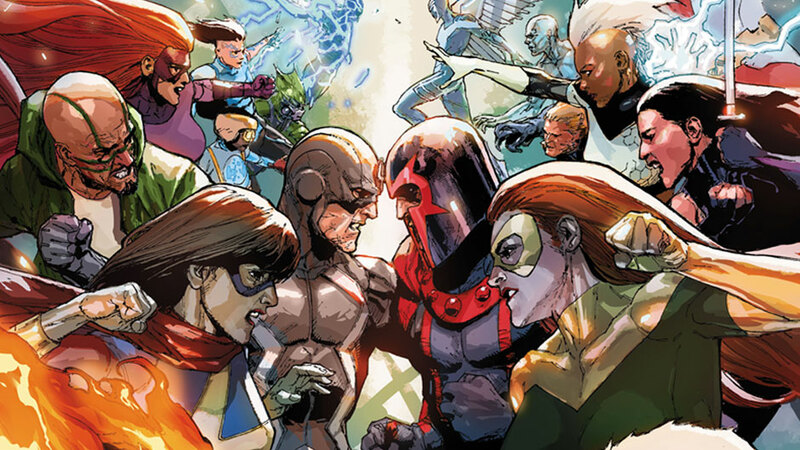 Comic Book Herald’s complete Avengers vs. X-Men reading order. Marvel NOW! sets a new status quo for the mutants, including the master of magnetism himself. Man I love this all-white Magneto costume. Magneto’s excellent Marvel NOW! solo series by writer Cullen Bunn. One of the best Magneto reads and starting places for new readers. More than just about any series, Magneto’s “Last Days’ before 2015’s Secret Wars maintain the excellence of the series to date. A tie-in return to the House of M universe, with a focus from Magneto’s point of view. Following the conclusion of Secret Wars, Marvel launches an All-New All-Different universe in which Magneto leads the Uncanny X-Men ongoing. Comic Book Herald’s complete Civil War 2 reading order.